According to the driver, who has yet to be named by police, a Dodge Caravan minivan cut him off shortly after he picked up a passenger at an apartment complex. One man exited the minivan holding two guns and pointed them at the driver. 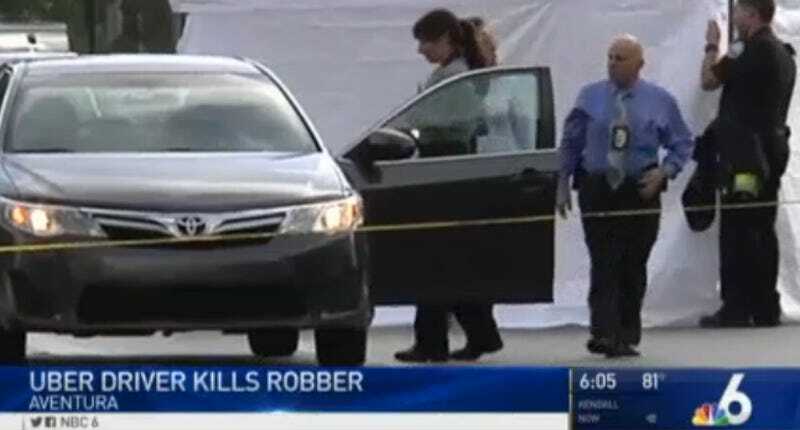 The Uber driver, who has a license to carry a firearm, shot and killed the would-be robber. The second man in the minivan drove off. Gizmodo has reached out to Uber and has not yet received a statement, but the local CBS station in Miami reports that the shooting started around 5am on Sunday. Uber drivers are forbidden from carrying guns, even in states where it’s legal to do so. This rule, however, is impossible to enforce given Uber’s decentralized nature. There’s no Uber safety monitor checking the glove compartment before a given Uber driver starts his day, for instance. This, of course, isn’t the first time that an Uber driver has used a firearm while on the job. Earlier this year, an Uber driver in Kalamazoo, Michigan shot eight people and killed six while he was working for Uber. He picked up passengers in between killings, and one passenger even joked with him (unknowingly, of course) about whether he was the killer. It’s unclear if the unnamed Uber driver in Florida will face any form of punishment from the company for breaking Uber’s no-guns policy. Police have said that they don’t expect to file charges since the shooting was in self-defense.